I firmly believe that photography is a powerful force for good in this world. As reportage, it opens our eyes to tragedies we might otherwise ignore; as landscape or wildlife photography, it reveals a beauty we too often take for granted, and encourages us to treat the planet with the respect it demands; as portraiture, it reminds us that each person has uncharted and unfathomable depths to their humanity that we may never truly understand. But there is a line. Cross it, and the art of photography is twisted into something that does harm—into vandalism, and animal cruelty, and doing outright harm to the environment in the name of a pretty picture. This post is about the dark side of photography. Jimmy McIntyre recently captured a photo he’s been dreaming of for years. 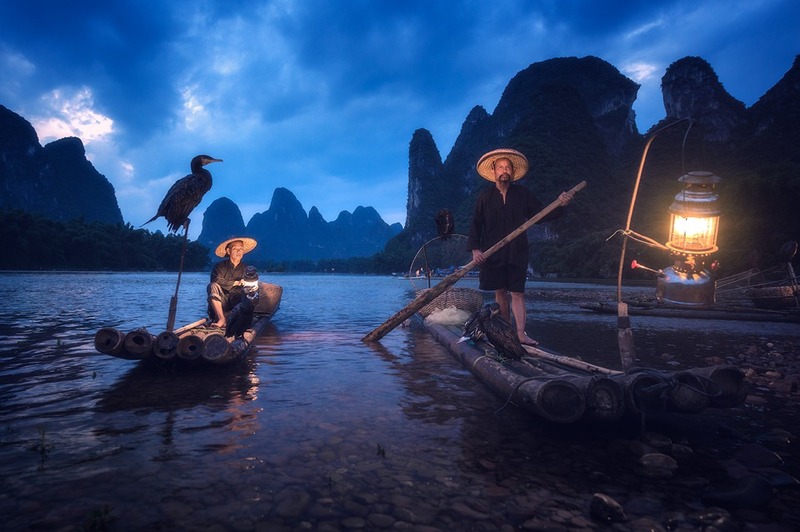 In China, standing waist deep in the Li river, he finally shot a portrait of the famed cormorant fishermen. But the experience came at a cost. They say ignorance is bliss and Jimmy is no longer ignorant of how these photos come to be. You see these ‘fishermen’ haven’t been fishermen for a long time, because they make much more money from tourist photographers paying them to play model. I’ve heard photographers lament the end of the cormorant fishermen, but I’ve never before heard one admit that we may have played a major role in bringing it about. Often, in photos of these fishermen, you see the fishing birds with their mighty wings wide open. It makes for an interesting sight, and I’d hoped to capture that, too. What I didn’t realize was that to get the bird to do that, the fishermen grab the bird by the neck and dunk it in the water. The bird then stands with its wings open to let them dry out. I honestly didn’t have the heart to ask the fisherman to do that. I’m sure not all of those photos of cormorant fishermen shared online are captured in this way—some photographers no doubt get lucky. But anybody who has paid a man to grab a bird by the neck and dunk it in the river just so they can get a better composition has lost sight of the purpose of photography… and the respect of his or her peers. I have seen photographers that call themselves “nature photographers” cutting branches off trees, and even worse once in Indonesia, while diving, I have seen some “wildlife photographers” breaking coral reefs and rearranging them to get the perfect shot. That made me really angry and I am sure some of those photographers have presented their “untouched” RAW images in competitions but I wish they had actually done some cloning in Photoshop instead. How a photographer can justify destroying the nature they’re supposed to be documenting and sharing with the world for the sake of a prettier picture I’ll never understand. It feels tantamount to selling your soul for a few more likes, or an ill-gotten award. Photographers like Ellen Cuylaerts—who captured the beautiful image above—harbor a deep respect for the undersea creatures they photograph. Not everyone does though. The final story comes from my own diving certification class. Speaking to our instructor, a technical diver of over 12 years, about some of his most memorable experiences, the conversation took a dark turn when he told us about what he has seen some underwater photographers doing in the tropics. It’s probably the worst thing I’ve seen, and the thing that pisses me off the most. You’ll see these photographers down there, taking pictures of a turtle, and between shots they’re literally pushing the turtle down deeper as they try to get away. Then you watch as these poor turtles struggle to get back to the surface to take a breath, because they’ve lost too much buoyancy. As anybody with any diving experience knows, you become less bouyant the deeper underwater you go because the water pressure compresses the air in your lungs, suit, tank, etc. Before they dive, turtles take an appropriate breath for the depth they’ll go to and the time they plan to stay underwater. So when a photographer does what my instructor described, they could very possibly be killing their subject. It’s so very easy to turn a blind eye to the injustices perpetrated in the name of photography, but as photographers or even just lovers of this art it’s up to us to hold photos and photo takers to a higher standard. There’ll come a day when you have the opportunity to do damage to “get the shot,” or stand idly by as someone else does. On that day, I hope these stories come to mind and encourage you to speak up. This article was written by DL Cade of 500PX and formerly PetaPixel. The article was originally posted here and has been shared with explicit permission.